JSRCC students recently received first place wins at the Virginia Phi Beta Lambda State Leadership Conference for future business leaders. Reynolds received first place for its community service project sponsoring the Salvation Army Food Pantry. For several years, the Reynolds chapter of Phi Beta Lamba has collected food for the Salvation Army. This year, the group more than doubled collections – delivering over 3,800 pounds of food to the pantry just before Thanksgiving. The project was presented by JSRCC students Matthew Hylton, Krystal Brooks, and Clarissa Smithee. Winners at the leadership conference will compete at the national level in Nashville this July. 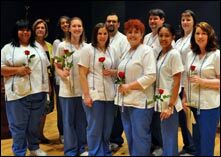 JSRCC recently recognized nearly 75 students who completed the Associate of Applied Science degree in Nursing. Held in the Lipman Auditorium of the Massey Library Technology Center, the ceremony opened with a welcome by JSRCC President Dr. Gary Rhodes and inspirational words by JSRCC nursing program coordinator Nancy O’Donnell, RN, MS.
After sharing with the students some of the difficulties she faced when coming out of college, O’Donnell challenged the students not only to try new adventures in the profession, but to be someone that gets things done. After the award presentations, the graduates recited the Nurses’ Pledge.